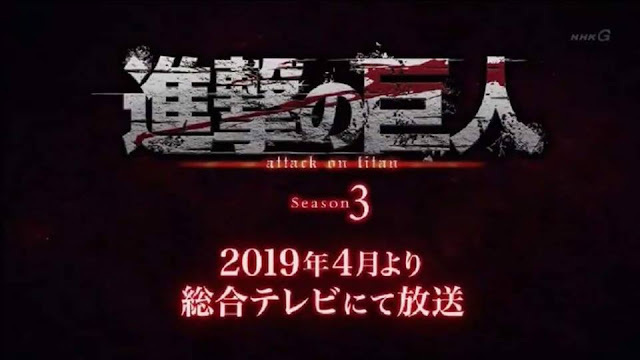 Attack on Titan Season 3 delayed until April 2019 after the end of episode 12, season 3 of Attack on Titan was officially broken down into two parts. The first part known as the uprising arc has ended at episode 12 of season 3. The new arc "The return to Shiganshina Arc" to resume season 3 in April 2019. Bad news is that Attack On Titan is delayed until April 2019. After this episode, it will return in April of 2019. One of the reasons is that they are giving time for manga to move ahead in story so that they don't have to stop the production anime due to lack of source material like what happened after season 1. They had to stop production of anime for 4 years just so they had source material to create content from. The other reason being NHK has other things to broadcast other than this anime, hence the anime briefly stops here. It's to give way to another show that has reserved this time-slot. NHK is a national channel in Japan. So it's possible they allotted the time frame to some other show. You may think that in everyone's layman view this delay was not necessary, but this is a significant move by any broadcast station in Japan, due to plethora amount of studio that pumps out shows and series that needs to be broadcasted for revenue. The final reason is that its all an effort to build hype. Imagine the return of the Attack titan to fight the armored and the colossal titan in 2019. Surely anyone who has watched the series can get goosebumps thinking about this. So, finally Attack on Titan Season 3 delayed until April 2019. Don't forget to follow my Attack on Titan Memes page on facebook and the blog AKBlogs on facebook & Twitter.